The rays of ‘Solar Punjab’ are so bright that in the third phase bidding for solar projects held on August 26, Punjab Energy Development Agency (PEDA) has received 18 bids with cumulative capacity 1650 MW against offered capacity of 500 MW. The bidding has over subscribed by more than three times which is highest as compared to other bigger states that has carried bidding recently for similar capacity solar projects.These 500 MW projects will bring investment of Rs 3500 Cr in addition to Rs. 4000 Cr already invested on 540 MW solar projects in the state.Disclosing this here today, Punjab New and Renewable Energy Minister Mr. Bikram Singh Majithia said all leading national and international companies namely, Sun Edison, First Solar and Sky Power from US, Solar Pack Corporation Spain, Emami Power, Sun Pharma, Acme, Hero Group, Welspun and Azure Power had participated in the bidding process. He informed that the allocation process will be completed by the end of next month. Mr. Majithia said the overwhelming response from international solar power players had once again confirmed that the State’s renewable energy policy was the best in the country. 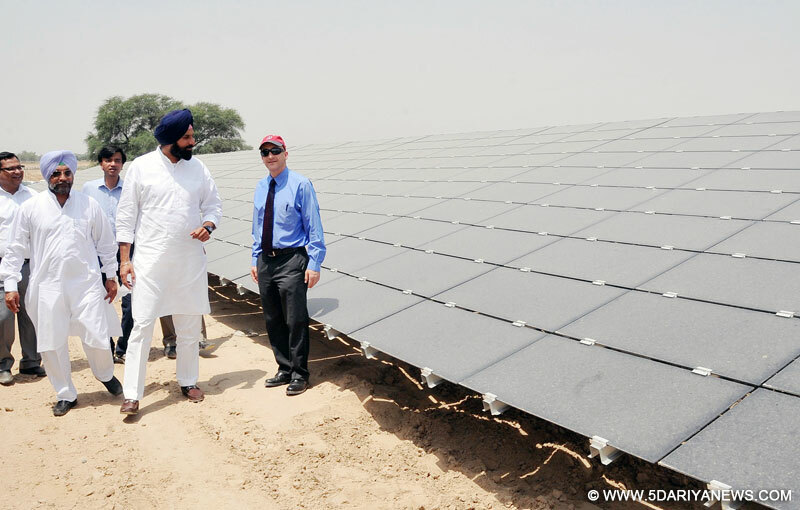 "It is to the credit of Punjab that it had succeeded in its Go Solar mission despite constraints of land. We do not have any wastelands or deserts, yet Punjab is the most preferred state for investors as compared to other states which are 5 to 7 times larger in area. We have backed up our solar mission with a 25 year power purchase agreement with our electricity utility – the PSPCL. The fact that PSPCL has got a good credit rating of A+ has also boosted investor confidence”, said the Minister. Majithia also credits the vision of the Deputy Chief Minister of Punjab, Sukhbir Singh Badal, for establishing a potent ease of doing business climate in the State. "With the astute understanding and visionary approach of Deputy Chief Minister Sukhbir Singh Badal, Punjab today is in the throes of being a potent business destination. For the first time in India, a unified one-stop regulatory system for fiscal incentive approvals, clearances, applications, submissions and more has been set up envisaging the need of the industry by the Deputy Chief Minister", he added.Mr. Majithia said that Punjab leads the nation on many frontiers and provides a progressive investment ecosystem. "As on date, Punjab has one of the finest air and road connectivity, strongest labour markets with a multilingual work force, peaceful labour relations, no union divide, no strikes and availability of highly skilled & specialized manpower. Moreover, hassle free land acquisition and land lease policies, pro-business policies, incentives, infrastructure, power provision, and ease of doing business make Punjab an attractive investment destination for companies", he added. Sharing his future plans, Mr. Majithia said Punjab had been enhancing its renewable energy share, especially solar energy, at a very fast pace. “In the current five year plan, the capacity addition in solar has increased from 9 mw to more than 500 mw. The target has been set to generate solar power capacity upto 1500 MW by December 2016”, he added.It may be added that Punjab has taken steady strides towards achieving power self -sufficiency and further to be a power surplus State, with due consideration to the use of clean & green energy. State Government initiatives have aimed at providing a platform and a hospitable environment for the facilitation of renewable energy production within Punjab.